From "Gasoline Alley" to Lynda Barry and beyond, a tradition of comic artists in Wisconsin. Who knew? 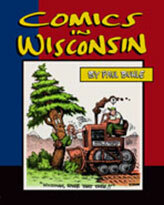 Wisconsin comic artists, editors, and publishers have made both central and fringe contributions to the language, form, and content of comic strips, comic books, and other forms of this popular art. Paul Buhle traces this history, illustrated by more than two hundred reproductions, from "The Gumps" and "Gasoline Alley"—which introduced the continuity of daily life into newspaper "funnies"—to comic book histories of Students for a Democratic Society and the Industrial Workers of the World, alternative press comics that fostered talents like Lynda Barry and James Sturm, and comic adaptations of totemic figures like Howard Zinn and Studs Terkel. Specialists and collectors will treasure this volume, and readers will find themselves educated and vastly entertained. Includes the work of Art Young, Frank O. King, Sidney Smith, Harvey Kurtzman, Bill Griffith, Sharon Rudahl, Gilbert Shelton, Howard Cruse, Alison Bechdel, Trina Robbins, Art Spiegelman, Mike Konopacki, James Sturm, and Lynda Barry. Cover is by R. Crumb. Paul Buhle was a senior lecturer at Brown University and in retirement is a returnee to Madison, where he earned a Ph.D. at the University of Wisconsin. His forty published volumes include a dozen comic art volumes, five biographies, and a book series on the victims of the Hollywood Blacklist.